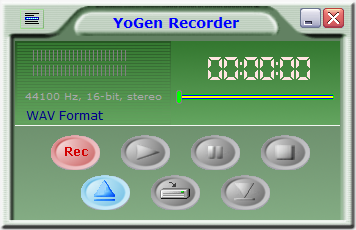 YoGen Recorder-Experience the power of creating your own digitized recordings. YoGen Recorder makes it easy to create high quality digital reproductions you will enjoy listening to. It will record sound coming from:other programs : Media Player, Real Player, QuickTime, VLC, etc. analog line-in : LP player, CD player, TV, Radio, etc. microphone : external or built-in. WAV, WMA, MP3 and VOX Recording and Playback. Sound Activated Recording. Qweas is providing links to YoGen Recorder 3.5.14 as a courtesy, and makes no representations regarding YoGen Recorder or any other applications or any information related thereto. Any questions, complaints or claims regarding this application YoGen Recorder 3.5.14 must be directed to the appropriate software vendor. You may click the publisher link of YoGen Recorder on the top of this page to get more details about the vendor.